Replies: 99 (Who? ), Viewed: 98751 times. Is there a way to generate basic cheat command executing interactions (CommandSuperInteraction) purely from code? There are nice tutorials for Sims 3.... I got Python code to run nicely so if I could just do it from there.. I've written a bit of a tutorial that demonstrates how to build all the XML, SimData and attach the super affordances to an object. It's actually kind of a useful mod, too, I think I'll keep it in my game! Attached is a zip file containing a PDF tutorial and all the example files. 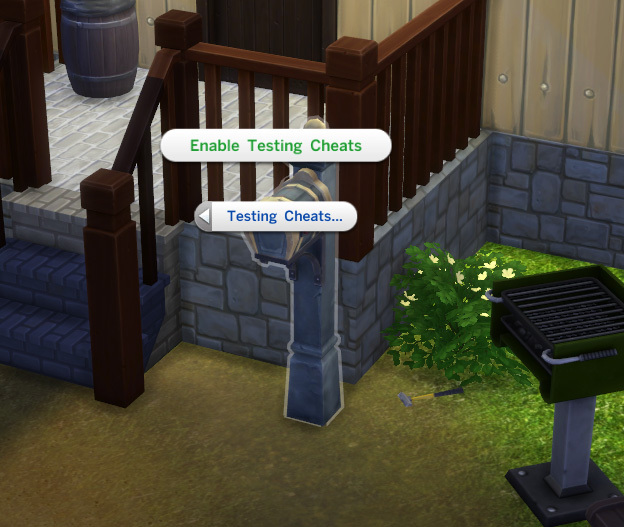 The mod adds an Enable and Disable Testing Cheats pie menu to the lot mailboxes. EDIT 07/05/2018 - Fogity's Modding Toolbox as used in the tutorial is no longer available, so I have written an updated version available here in the Modding Tools forum. Changed interactions to ImmediateSuperInteraction class. Updated tutorial PDF for S4PE changes to STBL edit process. Updated script to use the game's cheat service. I wanted to try your example, but since I can't find the modding toolbox anywhere I haven't really gotten anywhere with it. I assume you are referring to the Fogity toolbox here: http://modthesims.info/showthread.p...25#startcomment - however, the link just leads to a non-viewable forum thread, so it's apparently not obtainable these days. Hmm, well you can create hashes in s4pe, but Fogity's toolbox is by far my favorite tool for generating hashes as it has the built in hex/dec converter as well. @Fogity any plans to make this available again, or should I be suggesting folks just use s4pe for hashing? #29 12th Apr 2015 at 7:20 PM Last edited by Aren : 12th Apr 2015 at 7:34 PM. I made a quick CLI tool you could use in the meantime until Fogity gets it re-uploaded. Just double click on Hasher.bat and enter in the text you want to hash. It's obviously not as pretty, but it'll get the job done. Edit: Oh, and you may want to look up how to copy values from cmd.exe if you haven't already. You'll need to enable QuickEdit, but there are instructions for how to do this online. You'll also need Python installed and added to your path (it gives you an option to do that during installation). I am working on a new version, but I am not quite done with it yet. So in the meantime I can give you a link to the old version (they are functionally equivalent), and feel free to share it if someone else wants to use it. I was talking to Scumbumbo about this and noticed that when attaching to Sims or Objects through on_add, you are doing it every time they are instanced, which could cause an impact in performance. So, I have been looking into doing a way of doing it once. What I came-up with is injecting into the instance manager right after all the tuning files are loaded. At that point, you can add your affordances to the object tuning files and they'll be there for the rest of the time the game is running. It may cause a slightly longer loading time, but once you're to the main menu, it should not have to be added to the objects again. Can you explain more about injecting into sims? I have some experience with C++ but I don't have much experience with Python, only helped a guy long time ago in a brief part of his code. I also don't know anything about the attributes in the Sims 4 variables. I can try to explain it a little. Scumbumbo wrote up a post describing it way way back, I think. I believe it was around the time Sims 4 was released. That was where I started reading about it and learning it. Also, looking through the py files in the script mods that he released usually had some small examples that I could "absorb" from. In theory, any method in an EA python module, we can inject into and basically wrap it so our own method is called instead. From our method, we can then choose to call the base method when we want to (doing custom coding before or after it) or bypass it altogether and use our own script (I try to avoid this as you never know when they'll add something to the method that you aren't accounting for). # Do any custom coding you want here, which will happen after the EA-scripts for zone loading finish. This is a really simple example of a method and I LOVE it when they are this simple. Any time you do a wrapper on a standard method, there is ALWAYS an "original" object that you'll need as the first parameter in the method you're writing to wrap around it. The "original" object is an actual reference to the EA function. So, to call that function and let the standard code run within your method, you would use original() sending it any additional parms defined by the core method, which in the example I showed above, is only "self". The call to "original(self)" would run that core method from within your own method. Then your injection would HAVE to take the parms past "self" into account as well in your injection. # Do any custom coding you want here, which will happen before the EA-scripts for do_really_cool_stuff runs. You can see that all the required parameters were specified on my new method in addition to the "original" object, and for all the optional parameters (anything with "="), I just used a generic "**kwargs" to catch them all and pass them to the original function. If I needed to overwrite those with some values or read what is in them, you can break them out within your method and the call to original just like we did with "more_stuff", "and_yet_more_stuff", etc. That's what I would consider entry-level injection. It gets a lot more complicated as you get into @classmethod decorators or @flexmethod decorators. Those don't behave like standard methods so injecting into them has tricks that you have to do, and I don't know that I've even figured out exactly how to make @flexmethods work yet. I think I've worked around them and used different methods each time. Another fun twist I discovered yesterday, if a method is marked in EA's core scripts as "@staticmethod", it may or may not have a "self" object, depending on how the method is called from elsewhere in EA's code. For example, PregnancyTracker.initialize_sim_info is called from adoptions with no "self" object, but called from pregnancy birth's with a "self" object. So, yay! You have to account for that and make sure you code appropriately! But in game, it doesn't work, no new interaction is showing up... Is something missing ? Tuto-How to create a career - Sims 4 open to suggestions. #40 1st Jun 2015 at 10:27 PM Last edited by OhMy!! : 8th Jun 2015 at 8:59 PM. So it seems SocialMixerInteractions aren't added to the sim's super affordance list, but rather to a similar list stored in a snippet tuning. To handle this, I used the same function that Deaderpool injected into an earlier example to alter tunings as they are loaded at the game startup. This seems to work well. The instance IDs are for some research I did for sachamagne. Altering this code to work with multiple instance IDs in a loop is an exercise left up to the reader, which should be a walk in the park for you if you've followed this thread this far. # straight for the mixer interaction directly from the affordance manager. # rather than just returning if the snippet id is invalid. Thanks again for that piece of study ! .. but that results in nonworkingness. What am I missing here? #44 4th Aug 2015 at 7:38 AM Last edited by scumbumbo : 5th Aug 2015 at 1:37 AM. #45 4th Aug 2015 at 4:36 PM Last edited by plasticbox : 5th Aug 2015 at 2:01 AM. Yeah now I see it too .. I'll test it out later, will let you know if I still see issues with it! Okay, initially your code did not work (kicked me back out to the world selection when attempting to load a lot, and dumped an endless LastException complaining about 'sims4' not being a defined name), but now it does. Haven't done a lot of testing yet but the same lot that didn't load before now does, and the sims who live there can also swipe all the stuff that other sims have dropped onto that lot (which they wouldn't be able to by default). If you have two modules named identically only one of them will be used, so yes, if you need a customized injector it would have to use a different module name. Deaderpool has a really nice one he's whipped up that catches issues that may arise when EA updates a function to have different parameters. Hmm, at first I thought, "Duh how could I have forgotten that?" and then looked at my code and it's not importing sims4.resources. Not sure why it's working, maybe something else I was importing in my quick tests script file (which is full of a lot of random garbage, lol) imports that module. I'll edit the post to add that import. Actually I haven't tried to use the first one again -- maybe that would have worked too if it hadn't been for the missing import. I only changed it to the second one (of the two I quoted above) because that was what Deaderpool quoted in post #36 above. Possibly that caused an issue with the greycurse thing which was suddenly missing the is_injectable .. I guess? But wouldn't it make sense on the long run when people give their injectors individual names anyway? Right now it's like we're all silently relying on them all being identical .. Someone who's worked more with these might have better info, but an NPC job is usually attached to a "situation". You can add code in the XML for an interaction to make it only occur if the NPC is running that situation... but there might be a better way. You may want to open a new thread for this question, as it doesn't appear to deal with the topic of adding the affordances via Python.